Look what I came across the other day... April is supposedly a good month to find deals on fabric. Who knew? I finished up a new charm pack dress for Lauren today. The fabric is Eden by Lila Tueller. My charm pack dress tutorial is here, if you're interested. If you do make one of these dresses, I'd love to see a picture! I made two of these cute dresses. And we even used the same fabric:) I loved your tutorial and they turned out soooo cute. Now if the weather would behave so we could whip out our warmer clothes!!! Thanks for the great turorial---here are both links to the dresses I posted on my blog. That dress is just so stinkin' cute!!! wayyy too cute! i need to make a few! Just too cute, Lilacs are in full bloom here the dress reminds me of them. Oh how cute! 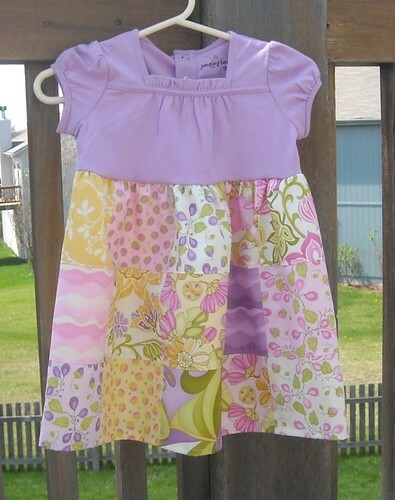 Back in the '70's I made my girls patchwork skirts.